Welcome back to Tales from the Brain Jar. When we had left off I had picked up a wonderfully gory Murmur picture from Ethan Van Sciver. It wouldn’t be for a couple more months before I got my next sketch at Dragon Con. To this day I still have problems explaining what I want from an artist when get a commission for the book. The brain jar thing can be hard to explain and it is usually easier to just hand them the book so they can see what has already been done. I love all the sketches in my book, but the one you are about to see is the one that other artists stop and comment about. What is it? Check after the jump. Eric Powell’s Goon was my next sketch. This sketch was done so quickly that it still blows my mind. I was chatting with Eric about the book and the where the next stories were going. Trying to get hints about Chinatown (it was only 05 at the time). All the time we are talking he is drawing and then before I know it the sketch was already completed. The way it is laid out I imagine that the viewer is looking through Frankie’s perspective. 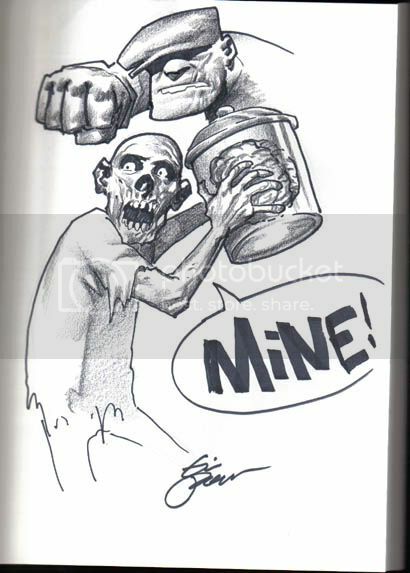 He is trying to steal the brain from the zombie and the undead slack-jaw has no idea that the Goon is behind him. It is so simple and so perfect for the character. I’m especially proud of this sketch since Brandon has been trying to get an Eric Powell sketch for a few years now and something always gets in his way. 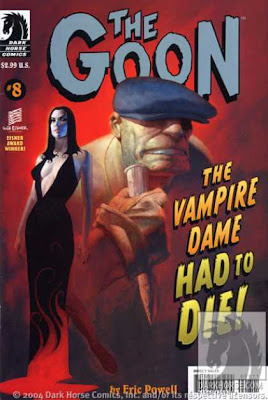 Confession time, the first time I read the Goon I didn’t like it. The problem wasn’t the book, it was me. Dark Horse at the time had such great Horror themed titles like Hellboy and Criminal Macabre. I was expecting something more serious. 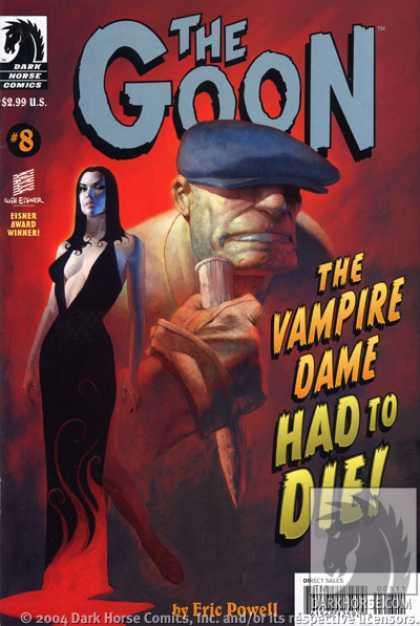 The first Goon issue I read was a slapstick gorefest. I reread it the next day, knowing what to expect and loved it. Now that I’ve seen more, I know it can be more then silly violence. Powel’s story telling can be incredibly moving when he wants it to be. And for the record, Chinatown was completely worth the wait, I’m glad he didn’t give be any hints. Sharktopus won’t be kept at bay! I’ll have just one more…..
3, 2, 1…oh thank god! Flash Friday, Drop that Puck!